An Affordable Yet Effective and Versatile Air Compressor! I know some inflation tasks are almost impossible to pull off without the help of an air compressor. Tires, balls, rafts, even your children’s inflatable pools have to be pumped full of air. Take for example, your car. Every once in a while, you need to check out the pressure in the tires and although this might not seem like a big deal, all those trips to and from the gas station end up costing you money. This is just one reason why I think having an air compressor really helps, not just economically but for convenience sake as well. Plus, that’s not the only job a tool like this can do. When you’re carrying out repairs on your home, you’re going to spend an awful lot of time nailing stuff down. Having a nifty nail gun to hand can make the job much easier and way faster, but you do need an air compressor to use one. One compressor that definitely fits the bill in this respect is the PORTER-CABLE CMB15 Fully Shrouded Compressor which is oil free. It also has a number of features that make it recognizable on its own. Let’s see what makes it so unique. One of the first things I noticed about this air compressor is it’s fully shrouded, making it ideal for transportation or use on rough terrain. Most drivers will appreciate its design since it will easily fit in the trunk of any car. As indicated by its name, the unit has a 1.5-gallon tank which is completely enclosed. It also comes with a built-in drain valve and rubber feet. The maximum tank pressure of 150 PSI is ideal for extended use. This compressor does not need oil to stay lubricated which means it will have a longer life as well as cheaper maintenance costs. The low electrical demand of just 120 volts makes sure the compressor starts up even when it’s cold, and it means you can plug it into an extension cord. The compressor produces 79dB of noise which puts it among the quieter compressors I have reviewed on my site so far. The casing what makes it unique, but it also serves a purpose and that is to protect you from hot and/or moving parts. The 25-feet coil hose and an 8-piece inflation kit also come as part of the package along with a one-year warranty. This handy tool is equipped with an oil-free pump which is great because you don’t have to worry about messy oil replacements. I also have to point out that oil-free systems tend to be more durable and last longer than their oil-lubricated counterparts. Personally, I think this compressor falls into the category of highly portable for numerous reasons (the most obvious one being the casing). It’s also extremely light, weighing just 20lbs which means you can get your kids to carry it for you. Just kidding! 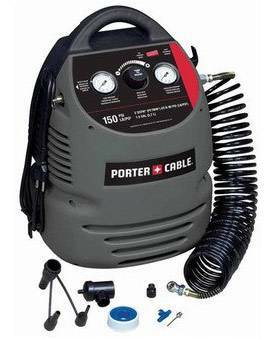 If your profession requires you to use a compressor, this bad boy is a great replacement for your usual bulky air compressor, and it will allow you to get more work done on location. Since it is so compact and light it is perfect for use in homes and apartments, and thanks to its relatively low noise during operation, you won’t wake your family or neighbors. The CMB15 also has rubber feet for better stability, and helps to keep your floors intact. The only maintenance you need to worry about is the moisture that collects inside the tank, but even that is made easier with the presence of a drain valve. Overall, the information I’ve been able to glean from others about this compressor has been very positive. Those who have invested in one love its portability, quick recovery time, and relatively low noise levels. It is also one of the more affordable options out there and inflation tasks are where this compressor really shines since it comes with an 8-piece inflation kit. But its use is not limited to just that. Jobs like nailing, cleaning and lots of others are super-easy with this little compressor. I couldn’t find anything negative to say about this little compressor. It does the job it was designed for splendidly. What more could you want? Go to Amazon and get one today!